Today is Emma’s 5th day of school and she still loves it! I was afraid that she would soon catch on to the fact that I leave her all day two days a week but she continues to walk right on into her class and kinda acts like she owns the place! :) She cracks me up. Her first week of school, she learned about the color red. For the past two weeks she has been pointing out all things red to us. She points to an object and says “THAT IS RED!! !” and then laughs hysterically. I used to give her whole bananas without the peel and she ate them like that. Now, she says “cut it like Miss Kaffy.” So, now I cut her bananas. Emma’s 2nd day- She looks a tad bit nervous, huh? 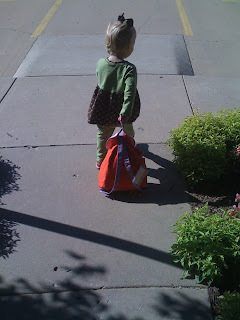 Emma’s 3rd day- she insisted on dragging her backpack out- she was tired! 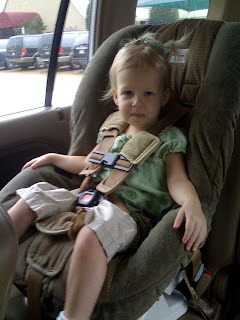 4th day of school- she was so excited! 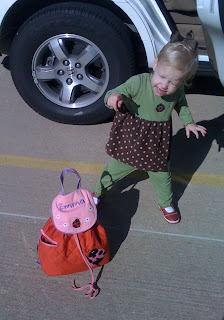 Ok, so I don’t plan to take Emma’s picture every morning before school for the rest of her life, I promise. I just couldn’t resist these first few weeks!